When doing a benchmark with PCMark10 (free), it use LibreOffice that is my default settings. Some calculations seem to cause this bug. 1.LibreOffice must be set by default program in windows. User Profile Reset: Yes i did. I'm a not a dev, so please try a benchmark with (free) PCMArk 10 to reproduce. 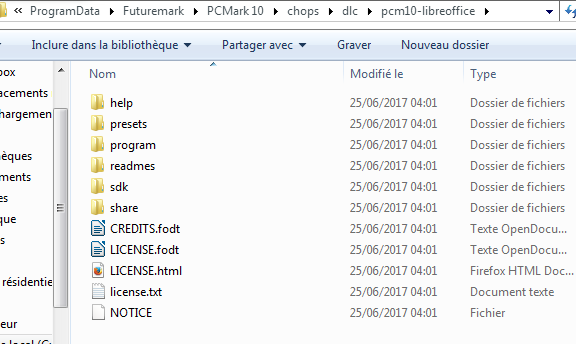 Can you start the LibreOffice bundled with PCMark separately, try to open C:\ProgramData\Futuremark\PCMark 10\dlc\pcm10-libreoffice\program\opencl\cl-test.ods, and report if you get the same issue there. Afterwards please attach C:\ProgramData\Futuremark\PCMark 10\dlc\pcm10-libreoffice\cache\opencl_devices.log. Folder /dlc is not here. My bad, it was in /chop folder. I opened cl-test.ods, it worked just fine. Nothing weird happened. No "cache" folder, and no opencl_devices.log file could be found. No idea what could be going wrong... also why there is no cache folder when you run the bundled LibreOffice separately. I see the cache folder in my case (not when it's run as part of the tests, though). I get no SEH Exception  when running the benchmark, btw. PCMark10 has been run on LOTS of systems without observing this failure mode. I suspect there’s something "special" about Gasto's system. - can you please try to find out in what way your system is different from the majority where they don't have such problems? - did you do anything to the LO bundled inside PCMark? The LO version inside of PCMark10 is the only version which PCMark10 should ever use. There is really nothing special about my configuration or my system. The issue is still here. Since then, I'm just using other equivalent software, with no issue. I think you can close the ticket. Thank You. > issue is still here. > Since then, I'm just using other equivalent software, with no issue. > I think you can close the ticket. Thank You. I have not been able to retrieve "Free Edition". So I instralled the "Basic Edition", but all benchmarks are locked (need to pay). Can you find the free version for me to try? But like i said before, I'm unable to launch a benchmark with PCMark10 now. All benchmarks are greyed/locked. I have uninstalled PCMArk 10. > I have uninstalled PCMArk 10.